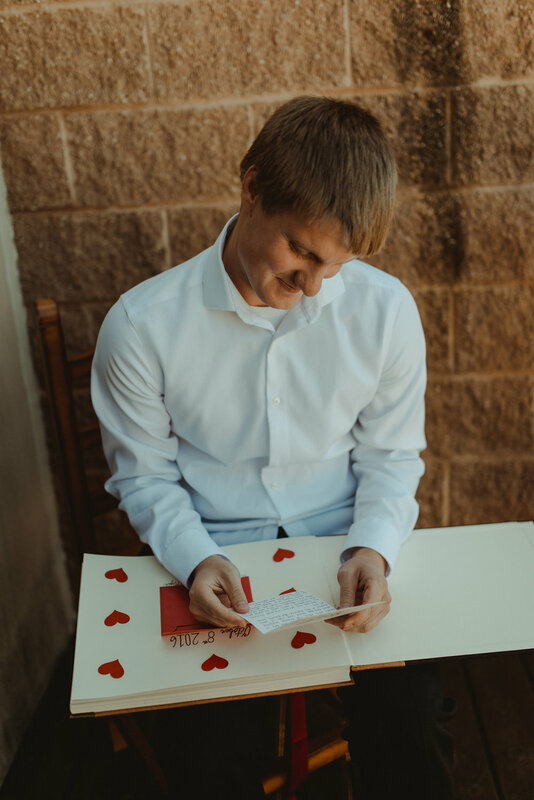 "In figuring out “how” I was going to ask Megan to spend the rest our lives together, I needed to come up with the “where.” In pondering this, I recalled so many special moments that we’ve had together and recollected all the places that we were fortunate enough to experience together. However, the place that I kept coming back to was her family’s tree farm near Wautoma. The tree farm, for us, created that irreplaceable sense of place and meaning. This place represented and is a part of so much for us and I quickly came to the realization that this would be the perfect place to propose to Megan. The most special tree farm location I could think of was the “climbing tree” (it is an awesome tree to climb). This pine tree is the largest tree around, and a place we ventured to often. With the setting picked out, I developed a plan to get her and both of our parents to the tree farm, all without her knowing what was going on. The entire process involved numerous indirect questions about what Megan’s weekends looked like; calling her parents and mine behind her back; double-checking to erase any trace of phone records that would have raised any suspicion; hiding decorations in my car and making sure she never ventured into my vehicle; and hiding the engagement ring at my parent’s home and in my duffle bag, into which I guessed she would never look. Eventually, I convinced Megan to come up to the tree farm for a “father-daughter weekend.” The plan was that by sunset (6:30), Megan and her dad would arrive at the “climbing tree.” With any luck, she would be totally surprised to see me and I would then propose with our other parents hidden from view, yet witnessing our moment together. With the sun setting, Megan and her dad approached. As Megan walked toward me, I couldn’t believe that the day had finally come and the moment that I dreamed would happen." Given the sweet background between these two, we knew we had to create a day that simply oozed romance. 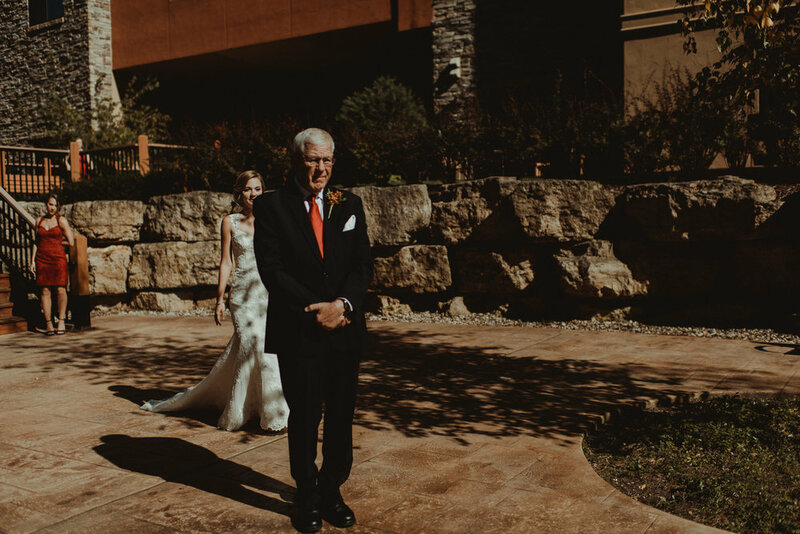 Luckily, with a few key design choices, the talented staff at Chula Vista, a gorgeous fall backdrop in the ravines of the Wisconsin Dells, and the sharp eye of Emily Schmidt Photography, it was pretty easy to achieve! We encourage every one of our clients to pursue unique, intentional details that truly speak to their personalities, and Megan, boy, did she deliver. 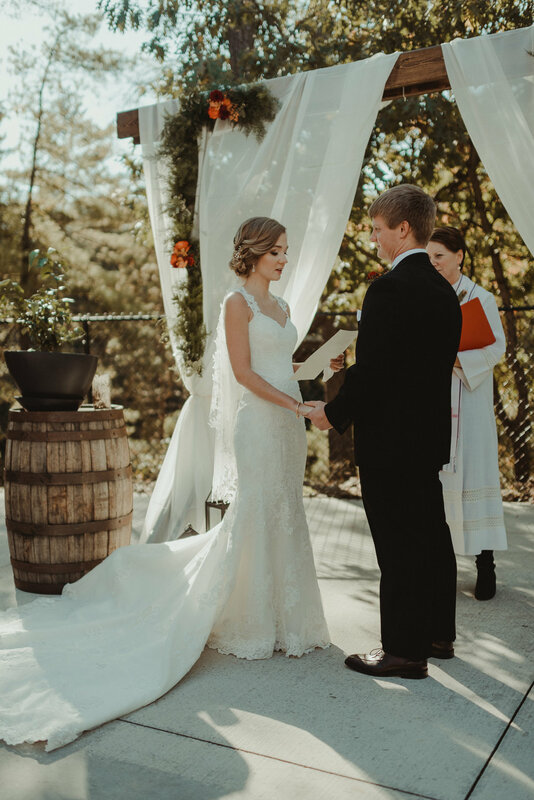 Every element included in their wedding day had meaning - from the string of photos leading their guests to the ceremony site, to the custom-built arbor made by her Dad, to the 1st Corinthians signs flanking the aisle, this girl had it covered. And using her bold color choices in cranberry, gold and black, we filled in the rest of the details by creating a cozy, romantic space in both the ceremony and the ballroom where guests could revel in their love and dance the night away! OH - and did we mention... BUCKY MADE AN APPEARANCE! Always love this guy - he's the life of the party! Venue and Catering: Chula Vista Resort | Photography: Emily Schmidt Photo | Florist: Fantasy Floral | Event Design and Coordination: Elevate Events | Dessert: Neat-O's Bake Shoppe | Entertainment and Photobooth: Celebrations Entertainment | Videography: Treehouse Media | Rentals: Event Essentials | Rentals and Seating Chart Sign: A La Crate Vintage Rentals | Paper Goods and Signage: Brink Creations | Marquee Rental: EZPZ Marquee | Hair: Beaute With In and Camille Walters | Makeup: Alicia Jaedike | Misc. Entertainment: Bucky Badger!